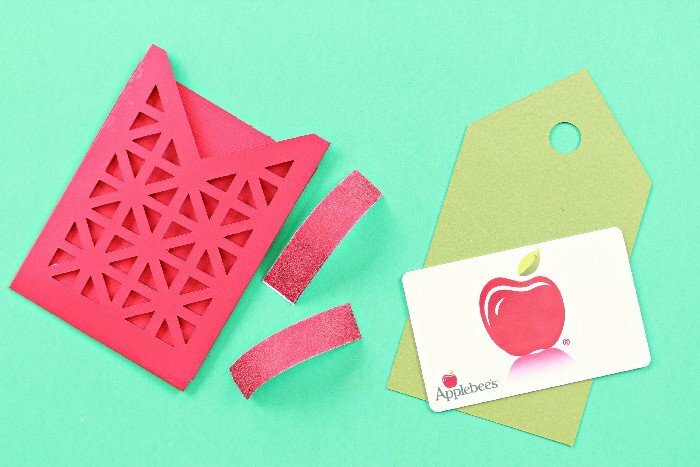 I say every year, but if you want to get your kids’ teachers a gift that they will really appreciate, GIVE THEM GIFT CARDS. Every teacher I have ever asked (and I know a lot of teachers), say that a hand-written note is the best gift you can give, and gift cards come a close second. 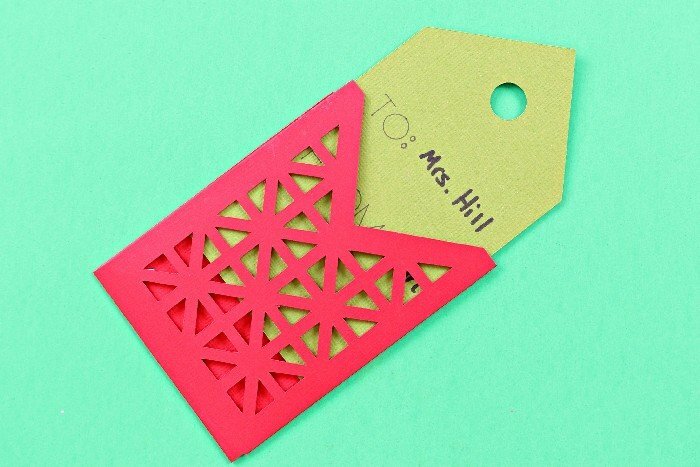 Give your student’s teacher a gift he is sure to use, and dress it up with a teacher appreciation gift card holder. 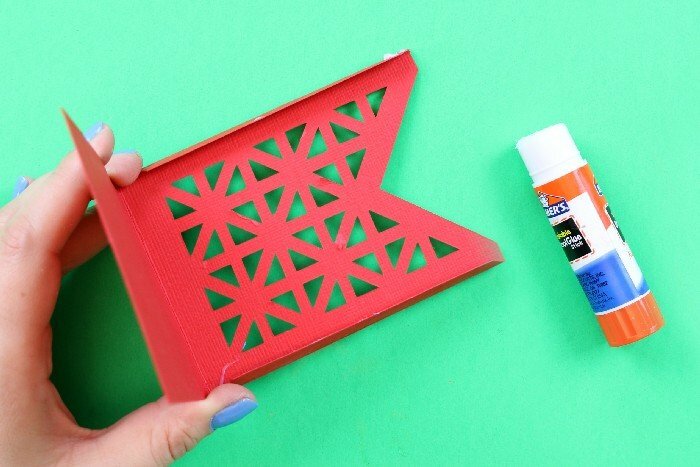 All this week I will be joining in with other creative bloggers to share end of the school projects you can make with your Cricut. 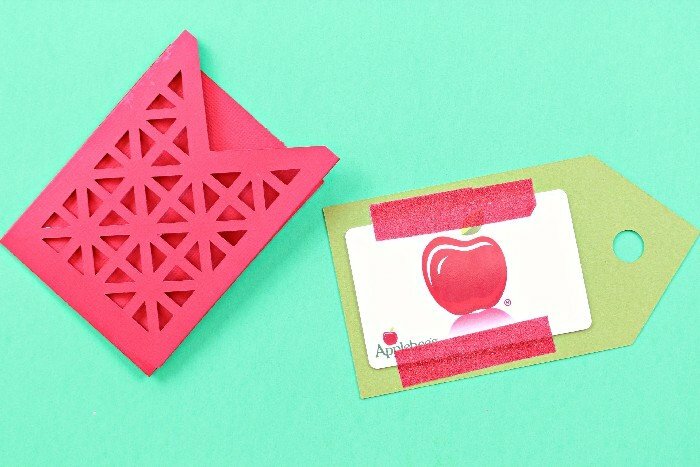 Be sure to come back each day for more DIYs. 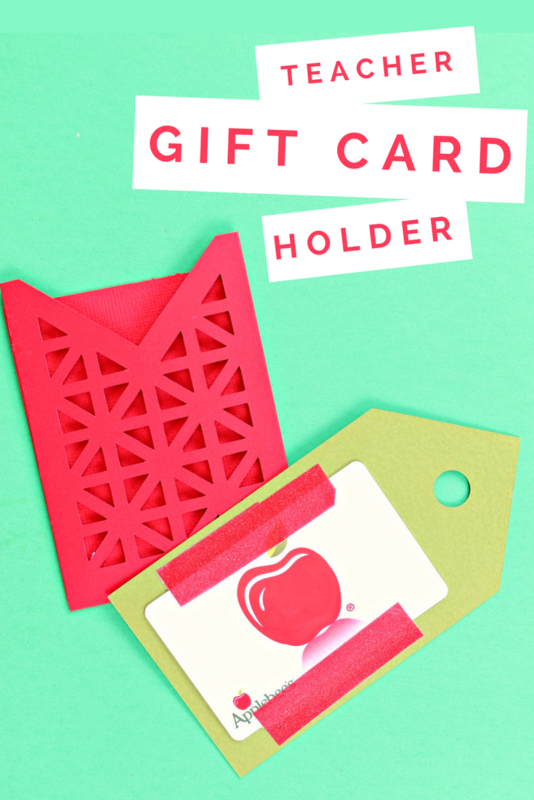 I started by using my Cricut to cut out the gift card sleeve from red cardstock. 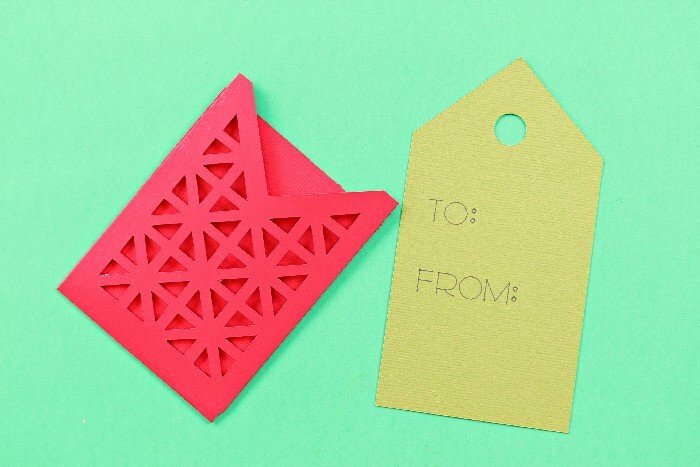 Remember to install the scoring tool into your Cricut before cutting out this design. I weeded out all the intricate triangles and folded on the scored lines. Next, I used a gluestick to assemble the gift card sleeve. 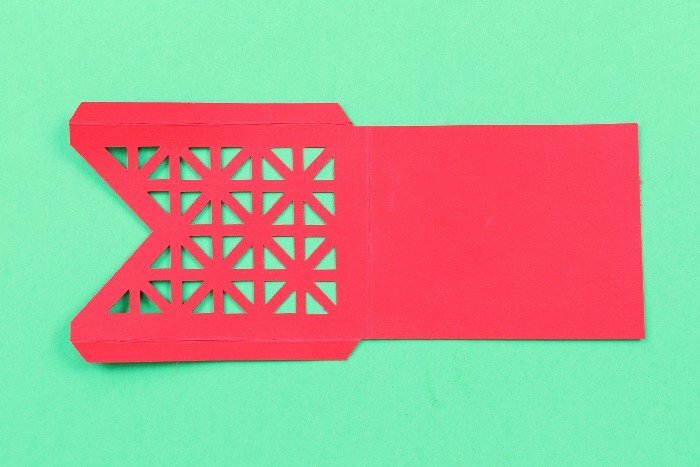 Next, I cut the gift card tag out of green cardstock. Remember to swap the scorer out for a black Cricut marker before cutting. The design will automatically add the TO and FROM to the tag. I used some glitter tape to attach the gift card to the back of the tag so that it doesn’t accidentally slip out of the card holder. All that was left to do was to add the names to the front of the tag. If you wanted to, you could add a ribbon to the hole in the tag as well. 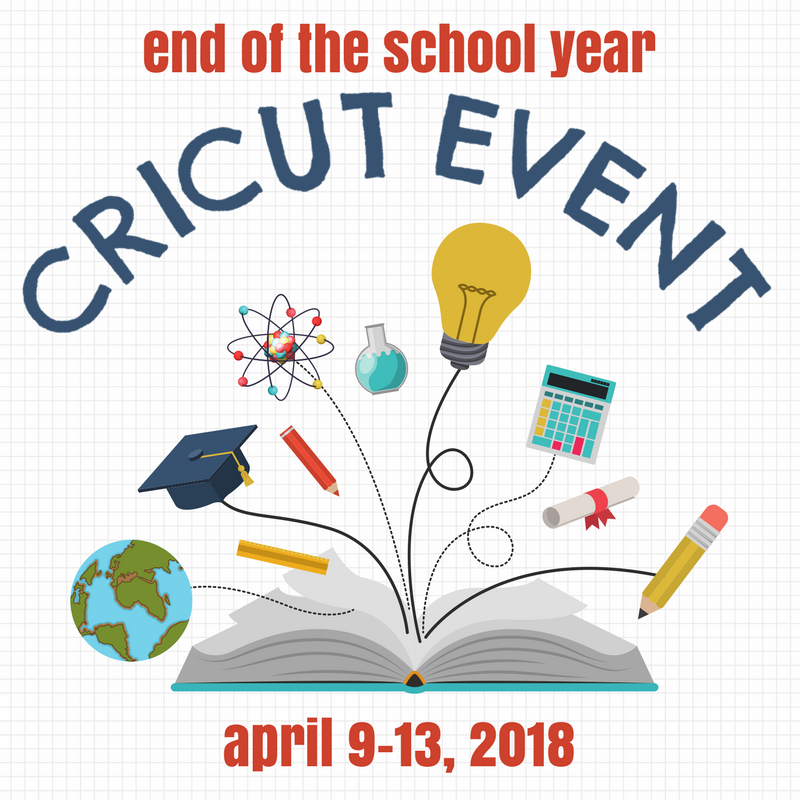 Be sure to check back in every day this week for more fun end of the school year tutorials!